Google 2-step verification for WordPress can be implemented just like Google’s own hosted sign in pages for self hosted WordPress by using API or simply plugin. Google 2-step verification for WordPress with SSL can definitely make your WordPress login quite strong. Unlike older methods to secure WordPress login with limiting the number of login attempts for preventing brute force attacks, Google 2-step verification for WordPress makes somewhat warranted and quantifiable security especially when combined with SSL. If you are just an WordPress user who needs extra security, you need to read this current paragraph, simply move to the next paragraph. SSL is not mandatory factor for implementing Google 2-step verification for WordPress. Not all countries support mobile phone system that can receive the verification code via text message or phone call. That list is given on the above mentioned web page of Google. If you are not sure whether will work or not with SSL for your setup, you can use a free SSL certificate as described in our Installing Free SSL Certificate for Rackspace Cloud Server guide. For Rackspace Cloud Sites you need to follow this guide. The best practice is to use Extended Validation SSL Certificate for very sensitive domain with wild card subdomain support, redirecting wp-login.php with CNAME to some subdomain looking webpage. The redirection for WordPress should be tweaked properly, otherwise the user will fail to login. The basic login of WordPress is fully dependent on MySQL Database. If the PHP of main server or database server (in case of scalable Cloud setup) fails to work, which can happen during an upgrade, if Apache2 (for typical LAMP server setup) does not work rightly, wp-config can be opened like a text file. It is quite rare with even a setup by a novice, but the risk is present. Practically there is no need to know hacking, people frankly can access your wp-config.php in browser. It can happen with debugging mode too. Unfortunately, both of these Google 2-step verification for WordPress Plugin are just basic and does not work for advanced EV SSL with CNAME redirection out of the box. After giving proper input, it would point towards the https version of wp-admin. In between these two, Google 2-step verification process will work, asking Google Server for the proper match. Google 2-step verification for WordPress in any method is fully dependent on Google’s server and the device. This Article Has Been Shared 340 Times! Backup WordPress blog to your Dropbox account using free Dropbox account and free Wordpress Plugin to backup to Dropbox automatically. W3 Total Cache Setup for Rackspace Cloud Sites with Cloud Files is a bit different than traditional hosting. Here is full guide on how to use W3 Total Cache. WordPress.org Like Page Specific Sidebar is one of the attractive feature that many users want to have.The WordPress Plugin landing page is somewhat like a CMS. Google AdSense Reporting Plugin for WordPress is not very difficult to develop. Here is guide for creating your own Plugin which will show your earning. I use Two-Factor Authentication across a lot of my accounts. I feel a lot more secure when I can telesign into my account with an OTP. It is worth the time and effort to have the confidence that your account won’t get hacked and your personal information isn’t up for grabs. It would be nice to see more of the leading companies in their respective verticals start giving their users the perfect balance between security and user experience. I know some will claim that 2FA makes things more complicated, but the slight inconvenience each time you log in is worth the confidence of knowing your info is secure. I’m hoping that more companies start to offer this awesome functionality. To me this should be a prerequisite to any system that wants to promote itself as being secure. 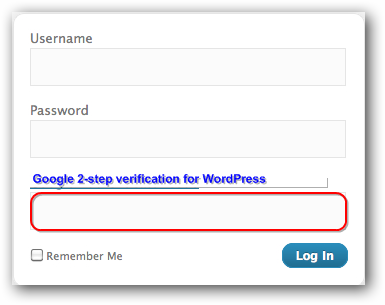 Cite this article as: Abhishek Ghosh, "Google 2-step verification for WordPress : Guide," in The Customize Windows, November 8, 2012, April 26, 2019, https://thecustomizewindows.com/2012/11/google-2-step-verification-for-wordpress-guide/.